At WWDC in one week, Apple is expected to formally announce a new on-demand streaming subscription service that will take on the likes of Spotify for $10 per month, but will not outright replace Beats Music at first, according to a new report. Details on Apple's plans for the iTunes brand going forward were revealed on Monday by The Wall Street Journal, which cited unnamed sources. Apple is expected to make the announcements at a keynote next Monday to kick off its annual Worldwide Developers Conference. The new streaming subscription service is not expected to replace Beats Music at first, the report said. Instead, Apple is expected to keep Beats Music separate for a time, before eventually migrating those users to the new unified service, giving the company time to work out "any kinks" that may exist. In preparation for the announcement, Apple is said to have been "rushing to finish work" not only on the service itself, but also the necessary contracts required. With less than a week to go, Apple has yet to ink contracts with the largest record labels, but it's expected those deals will be worked out in time. While the service will reportedly cost $10 per month, the Journal said Apple may offer a free trial period, and that certain songs might be made available for free at the discretion of labels. Apple is also unsurprisingly said to be planning to aggressively market the service, as it looks to take on competitors such as Spotify and Tidal. The current Beats Music service is similar to Spotify, charging users a monthly fee to access unlimited streaming music. Features that differentiate Beats Music include a "humanized" playlist function that allows for sharing and promoting of user-curated content. As for the changes to iTunes Radio, bringing in human DJs for specific stations will make the service more akin to traditional broadcast radio. Details on potential celebrity guest DJs, including Pharrell, David Guetta and Drake, were first revealed on Sunday. 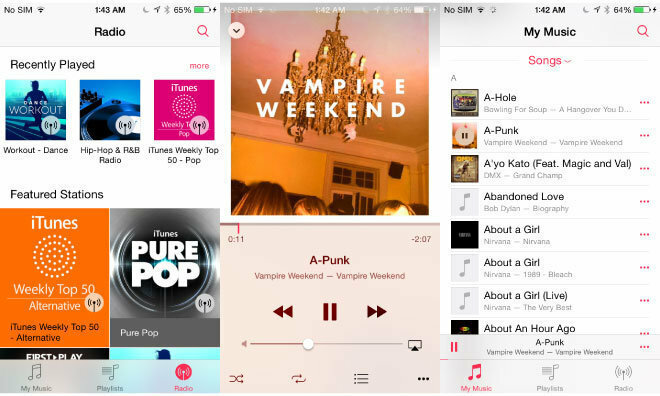 Unlike Beats Music or Apple's $10-per-month subscription service, iTunes Radio does not allow users to play specific songs or albums. Instead, like with Pandora, different tracks are served from a specific genre or category of music. iTunes Radio is available to listen for free with ads, or subscribers to the $25-per-year iTunes Match service can listen commercial-free. For years, Apple's iTunes Store has dominated the digital music market with traditional sales on a per-song and per-album basis. But in recent years, consumers have flocked to streaming music services tied to monthly subscription fees. Apple did not compete in that space until last year, when it bought Beats headphones and the associated Beats Music streaming service for $3 billion. It has been expected for some time that Apple would use its acquisition of Beats Music to help get a new iTunes-branded streaming service off the ground. WWDC 2015 will kick off with a keynote presentation next Monday at 10 a.m. Pacific, 1 p.m. Eastern. The company is also expected to show off the next-generation version of iOS and OS X. AppleInsider will have full, live coverage.